We began the season with a lecture by several members of the program at Semara University on Monday February 12th 2018, in order to introduce the main questions guiding the project, the originality of its pluri-disciplinary approach and our different methodologies and perspectives. The team is busy presenting their research at Samara University (photo C. Doubre). The originality of the AGXIM project lies in the transdisciplinary nature of the exchange between different team members with different areas of expertise. Two weeks in the field together resulted in a rich exchange of information on methodologies used and in conversations that lead to opportunities to advance our understanding of the region in holistic and multi-dimensional ways. 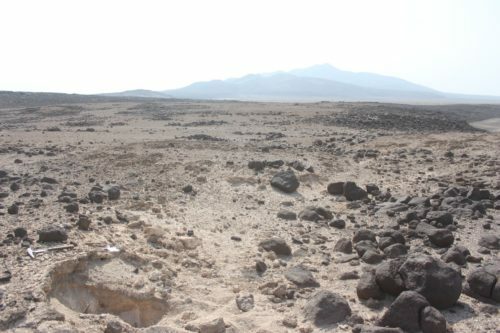 Even if the relations between human occupation and the natural landscape is broadly evident in such an arid and geologically active region, it is not always clear how the fieldwork and specific research questions of archaeologists and anthropological historians studying past cultures might overlap with those of seismologists, volcanologists, and geomorphologists. However, we consistently found ourselves referring back to different specialists with samples that we had acquired and with various questions at the end of every field day, and we were surprised to find them doing the same. The team is busy discussing about the structure of the Tendaho Basin (photo C. Doubre). C. Mologni, C. Doubre and L. Khalidi are busy reading a map with their headlights at the Borawli camp, Aissaita (photo. E. Ficquet). Because a number of questions can only be properly debated and discussed in the field, many exchanges were made possible and problems solved by the presence and collaboration of our colleagues. The team of anthropologists and historians was able to provide precise toponyms for different regions, but also historical facts and myths related to the inhabitants of the area, and the agricultural developments of the Awash River and regional lakes. The various fieldwork areas visited by the team led to important information on anthropological and historical issues related to more recent traditions. 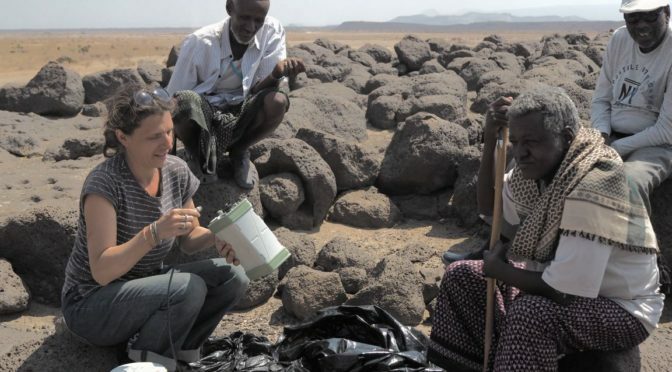 The linguistic and international diversity of the 25 person team (French, Italian, English, Spanish, Portuguese, Amharic, Afar, Arabic and Kiswahili) added another dimension to the busy collaboration which often turned into a communal investigation into the origin, use and meanings of a phrase or the name of a place. Logistical issues and solutions such as how to reach certain areas and whether they were accessible were regularly discussed and enabled us to increase our knowledge of the territory we had all come to know, each in our own ways, but which we could study, navigate, and understand better collectively. the formation of the Tendaho Basin over the Quaternary period (volcano-tectonic evolution [0-2 Ma – today], the evolution of the transgression/regression phases of the Afar lakes [10 ka – today] and of the hydrological basin [~200 years ago – today], and the locations of recent and current seismological and volcanic active zones in order to account for seismic and volcanic hazard. the societies that have traditionally inhabited this territory and how they account for telluric phenomena through memory of past events and their consequences. The project combines various time frames, employing various research methods that are not only oriented towards the production of unpublished data, but also attentive to the epistemological relationships that each discipline maintains within the field, as sources of information and catalysts for understanding. Understanding the landscape of the Tendaho Basin requires adopting a multi-scalar approach. Situated at the center of the Afar Depression, at the crossroads of three divergent plate boundaries, the formation of the basin shows the evolution of a tectonic extension related to the splitting of the African continent. It also offers insights into the processes involved during the transition from a continental lithosphere to an incipient oceanic ridge. The geology team focused on the magmato-tectonic history (over the last 4 Ma) of two active sites including the southeastern end of the Manda-Hararo rift and the sub-rift of Manda-Gargori. Precise geological mapping was conducted in these areas and samples were collected to date the lava using the Ar/Ar method and/or using cosmogenic isotope measurements (3He and 36Cl). Particular attention was given to the structural relations between the stratoid lava surfaces, the Gulf basalts and the recent lava flows concentrated on the axis of the two sub-rifts. Many ideas and methods were exchanged with the archeological team regarding the location and nature of the obsidian sources in the region and regarding the relationship between tectonic and volcanic structures and the sedimentary deposits. The geophysics team measured and densified the GPS network within and around the Tendaho basin. More than 15 points were measured in order to improve the accuracy of the velocities of the opening across the basin and to potentially detect transient deformation associated with the active structures and current seismic activity. A better characterisation of the active zones and structures will help us during interviews with current populations regarding their experiences, memory of and the consequences of seismic and volcanic hazards in the region. Our team worked together with the history team on the toponymy of the Awsa and surrounding region, and on collective and individual memory of telluric events, taking into account historical archives and instrumental seismic and volcanic catalogs. Our work builds on the last decade of research of several projects in the region such as the Actions Marges (INSU) and the DoRA project (ANR, CNES, KAUST). Team members: Cécile Doubre, Seismologist/Geodesist, IGPS, University of Strasbourg; mission leader, team leader; Jean-Bernard De Chabalier, Seismologist/Geodesist, IPGP, Paris; Raphaël Pik, Geochemist, Director of the CRPG, Nancy; Nicolas Bellahsen, Structural Geologist, ISTeP, Paris; Berhanu Bekele, IGSSA, University of Addis Ababa; Amdemichael Zafu, Geologist, Addis Ababa University, School of Earth Sciences. 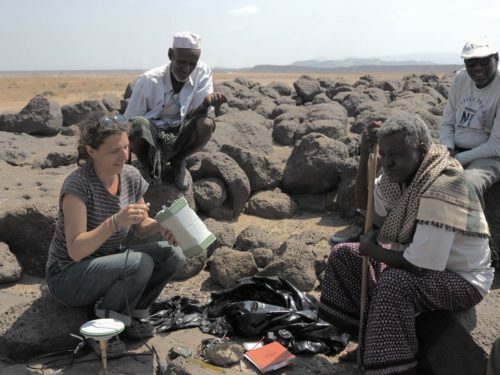 Cécile Doubre, busy installing instruments on Gammali hill near Kifillu, accompanied by Muhammad Hassan, Aramis Houmed, Alawi Abdusamad (photo. E. Ficquet). The VAPOR-Afar archaeological program directed by L. Khalidi (CEPAM-CNRS), was initiated in 2014 in the Lower Awash valley with the support of the Ethiopian ARCCH, the Afar Bureau of Culture and Tourism, the CFEE, the CNRS, AIYS and the Fyssen Foundation. 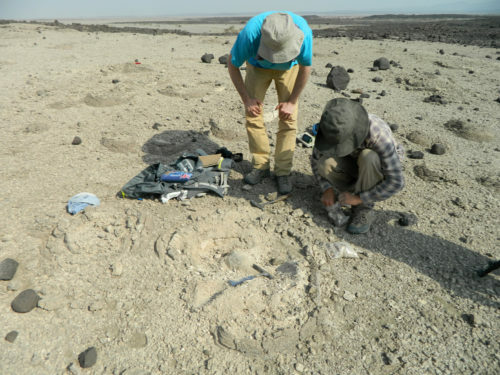 Since 2014 the program has been conducting archaeological and geomorphological surveys and excavations in the region to establish a late prehistoric occupation sequence in correlation with the evolution of the lake Abhe palaeobasin. Prior to the collaborative AGXIM fieldwork season, this program, which includes a large international team of specialists and postgraduate students, had identified a number of Late Stone Age (LSA) and ceramic Neolithic open-air sites unique to the Abhe lake basin as well as several obsidian sources exploited locally by these same populations. A number of soundings and excavations were carried out in order to recover more precise dates, to establish stone tool and ceramic typo-technological sequences in tandem with the identification of wild versus domestic fauna, and to contextualize human occupation and adaptation within a fluvio-lacustrine environment which had witnessed a series of major hydro-climatic fluctuations. While the region is well-known for its extremely rich hominid record, it is the first time that an LSA to late Neolithic occupation sequence with a rich decorated ceramic tradition has been identified in the Ethiopian Afar. In addition, the project has identified the largest number of late prehistoric sites in a single localized region of Ethiopia. After a busy day sampling a basaltic ridge of stromatolitic formations north of Borawli volcano whic looms on the horizon. (c) VAPOR-Afar. 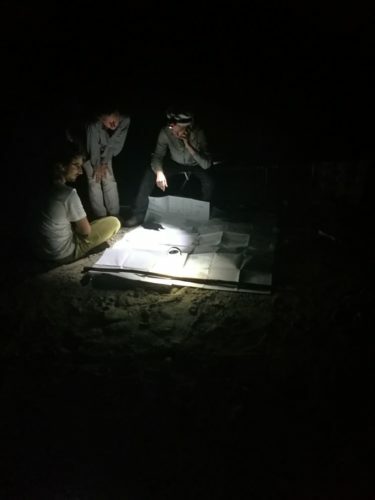 During the 2018 AGXIM field season we carried out new geomorphological surveys and soundings to sample and map the palaeoshores corresponding to Pleistocene and early Holocene transgressions (marked by stromatolitic, diatomitic and calcareous deposits) of Lake Abhe and recovered new prehistoric hilltop and palaeodune sites, some of which were still preserved within sedimentary archives. A series of soundings were conducted on sites in order to document and analyse the evolution of a landscape in which we consistently see the deposition of successive paleosol and aeolian formations that are evidence of stable humid and arid periods, respectively, and which we can correlate with human occupation sequences. The documentation and analysis of these sedimentary events enables us to better understand human adaptation strategies to changing environments during a period marked by the passage from hunter-gathering and fishing, to herding of cattle, sheep and goats. 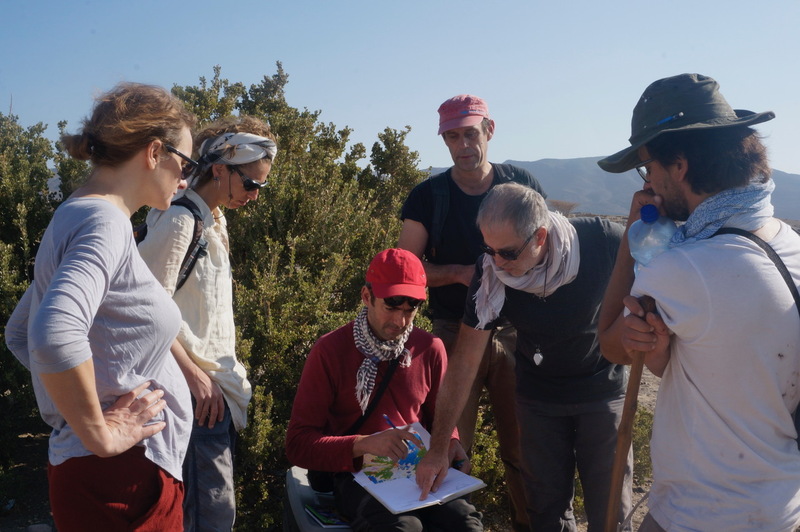 2018 fieldwork team members: Lamya Khalidi, Archaeologist, CEPAM, CNRS, University of Nice Sophia Antipolis, team leader; Mathieu Schuster, Sedimentologist, EOST, CNRS, University of Strasbourg; Carlo Mologni, Paleoclimatologist, PhD Student, University of Côte d’Azur, France; Natnael Wondie, ARCCH; Ahmed Mohamad, Afar Bureau of Culture and Tourism. Results obtained by Carlo Mologni with the VAPOR-Afar / AGXIM projects (and PSPCA in Djibouti) will be the basis for his doctoral dissertation (see our previous post here: cfee.hypotheses.org/2516). M. Schuster and C. Mologni busy sampling stromatolites formed many thousands of years ago when Abhe lake levels were significantly higher than today. (c) VAPOR-Afar. 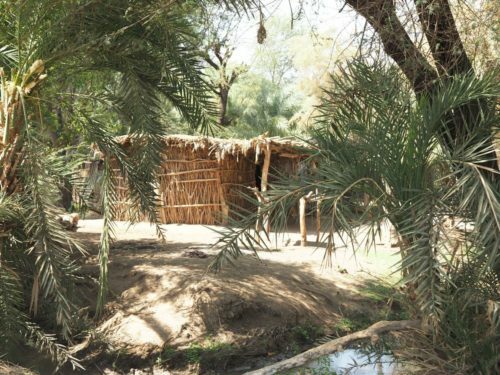 Whereas our team’s geo-scientists and archeologists mostly work outdoors in the aridity and heat of the land, the historians and social anthropologists of the project study the green and luxuriant cultivated areas watered by the many streams and man-made canals of the final course of the Awash River. This vast oasis in the heart of the Afar desert has a long millenary history of human settlement which is documented today by archaeology. Historical research in the region focuses on the last five centuries. Oral traditions in the Afar language and written sources in Arabic document several migration waves of populations that originated from the highland areas of Southern Tigray, East Shawa and Hararge. They introduced agricultural techniques to expand dry cultivated areas over flooded and swampy zones. These many groups have been incorporated into the Afar social structure as sedentary coexisting with the several surrounding pastoral nomadic groups through a complex social structure of alliances to share pasture land and protect each other from the outbreak of conflicts. The historical traditions of different local communities (Haralla, Kabirto, Doba’a, Mamule, Baydi’o, Integer, Kutubla) were studied by interviewing elders. View from the Abrantu traditional village in the Awsa oasis (photo. E. Ficquet). In the perspective of collaboration between geo-sciences and ethno-history, a particular effort was made by our team to record precise information on place names. Indeed maps are full of approximations, and this may create confusion in the designation of study sites. The local knowledge and representations associated to landscape were therefore thoroughly examined to the benefit of all team members. A particular achievement, carried out with the support of local authorities, was to reach the oasis of Harissa located at the very end of the course of the Awash River, where its last rivulets reach Lake Abhe. Another interdisciplinary aspect of our survey was collecting occurrences of natural events in oral history: earthquakes, volcanic eruptions, the appearance of fumaroles, floods, cracking and faulting, and saline water resurgence. Some of these events are explicitly recalled as natural events. Others have a more fantastic connotation, and are described as phenomena attributed to spirits or supernatural powers, but which are often associated with elements of landscape or natural phenomena. These traditions related to earth events can provide indications of places conducive to observations and inquiry in the field of the geosciences, and particularly to identify factors of risk that are measurable in the present day. Team members: Eloi Ficquet, historian, EHESS, France. 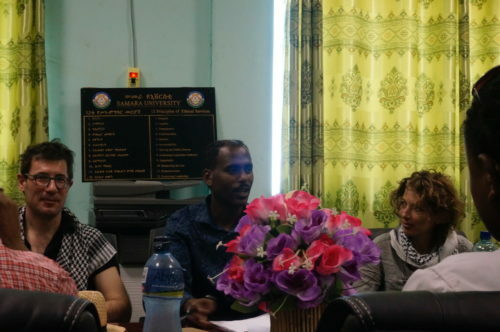 adjunct mission leader, team leader; Aramis Houmed Mohamed, historian, EHESS, Paris / Republic of Djibouti; Alawi Abdoussamad, Historian, Republic of Djibouti; Ato Miftah, Afar Bureau of Culture and Tourism; Fesseha Berhe, historian, Mekelle University; Julien Blanc, environment anthropologist, MNHN, Paris; Sophie Desgeorge, archivist, University of Strasbourg. 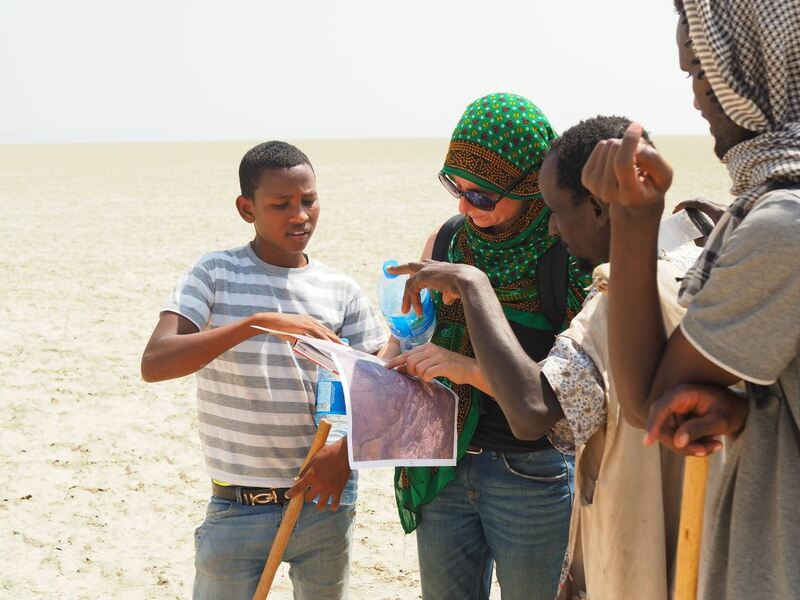 Cécile Doubre is busy collecting topographic information with Afar assistants in the arid plain of Abhe lake (photo. E. Ficquet). The treatment of data and analyses of the multidisciplinary program’s 2018 samples are currently underway and we look forward to the answers they will provide us and our colleagues, but also to new questions they will surely give rise to now that our fields of inquiry and curiosity have grown and we have new colleagues who can help us answer them. This project is funded by the French Institut National des Sciences de l’Univers (INSU) of the CNRS (TelluS-Rift grant) and is supported by the Institut de Physique du Globe of Strasbourg, the Institut des Sciences de la Terre of the Université Pierre et Marie Curie, the Institut de Physique du Globe de Paris, the Agence Nationale de la Recherche ETHIOMAP program, the Centre Français des Études Éthiopiennes, the Université de Strasbourg, the Centre de Recherches Pétrographiques et Géochimiques de Nancy, the University of Cambridge, the Institute of Ethiopian Studies (Addis Ababa University), the Institute of Geophysics, Space Sciences, and Astronomy (Addis Ababa University), the Department of Earth Sciences (Addis Ababa University), the Authority for Research and Conservation of Cultural Heritage. It also benefited from the support of the authorities of the Afar Regional State, in particular the Afar Bureau of Culture and Tourism, and the local administrations relevant to the visited areas. Another interdisciplinary field mission is planned in 2018/2019. 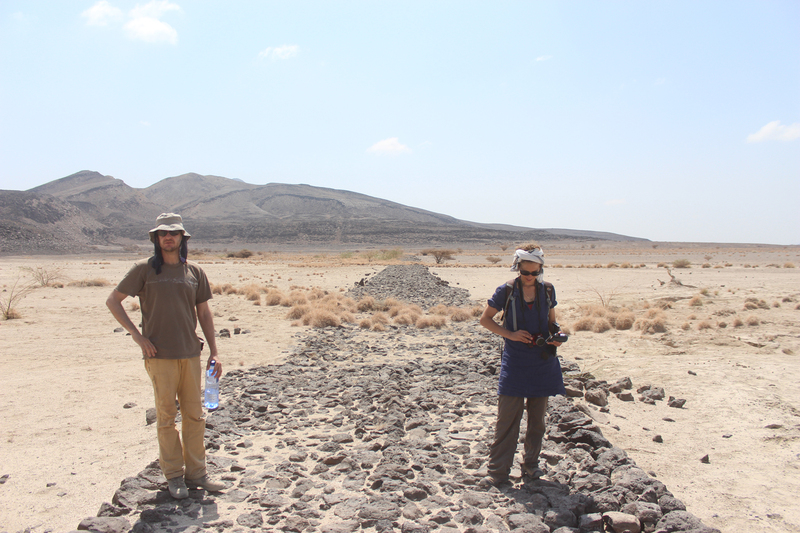 L. Khalidi and M. Schuster taking GPS points on a historic road that has long gone out of use. The road was built by Haile Selassie I and crosses the arid Kurub Bahari plain (c) VAPOR-Afar.